When planning the purchase of a new bargain television or computer, we’re usually concerned with facts and figures like screen size, weight, and processing power. But new service Enervee wants to change your thinking, offering a website loaded with tons of free energy efficiency information to help you base your next decision on environmental impact and electricity cost instead. 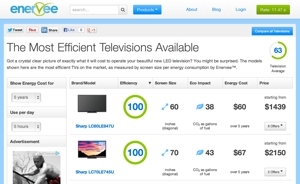 The Enervee website provides key green-conscious tech information about each individual television, computer, and similar tech item on the site. You can compare carbon footprints and get an estimate of how much money worth of electricity the item will use over the next 5 years. Products can be sorted based on popularity, price, and efficiency, and you can click through to read reviews and buy items through Amazon once you feel secure in your decision. If you’re in the market for a major new tech device, you owe it to the environment – and your own pocketbook – to take a quick look at the free Enervee service and make sure you make an energy-efficient choice. Remember, a device that uses more electricity isn’t necessarily better, it’s just more expensive.